As I was in a bit of a rush I didn’t really have time to fondle the packets, just enough to make sure the five I grabbed were all different. 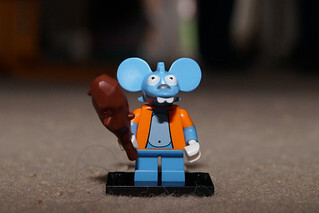 Actually I chose four, but Harry picked up a fifth that was quite obviously Itchy so that got added to the haul. 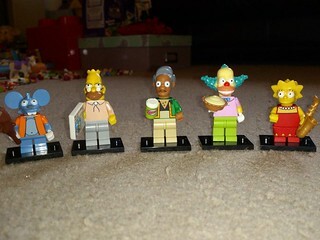 At first glance it disappointingly looked like six of the figures, Homer, Marge, Bart, Lisa, Maggie and Ned were the same as those in the house – however on closer inspection the heads or eyes in particular are different, plus they have different accessories to those from the house. 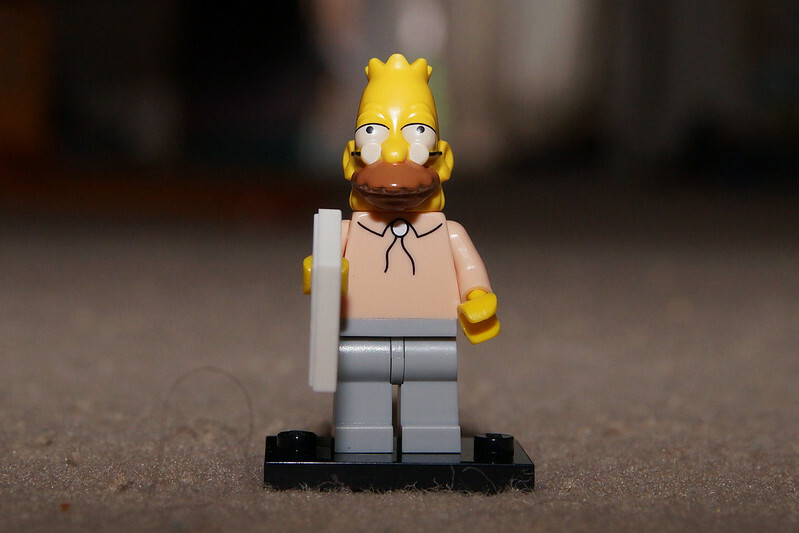 Anyway, who did I get? 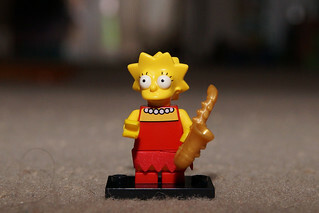 Lisa – as mentioned above this is the same minifig as that supplied with the house. Quite easy to feel with her spiky hair and saxophone. Grampa – fairly easy to feel due to the shape of his head and the newspaper piece. 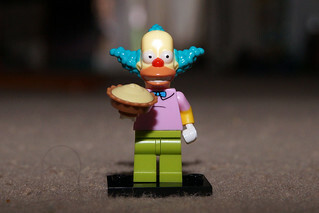 Krusty the Clown – quite distinctive head shape with his hair sticking out, although if thats not enough he’s also the only one with a pie. 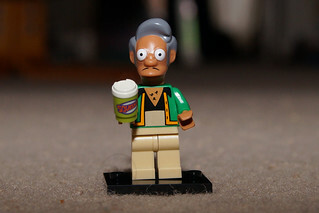 Apu – he was a bit of a surprise as I wasn’t really sure who he was, but like the rest of the set the head is a different shape and he has his Squishee cup. Itchy – again another completely different head shape with the ears the give away, and if you fondle more his club. 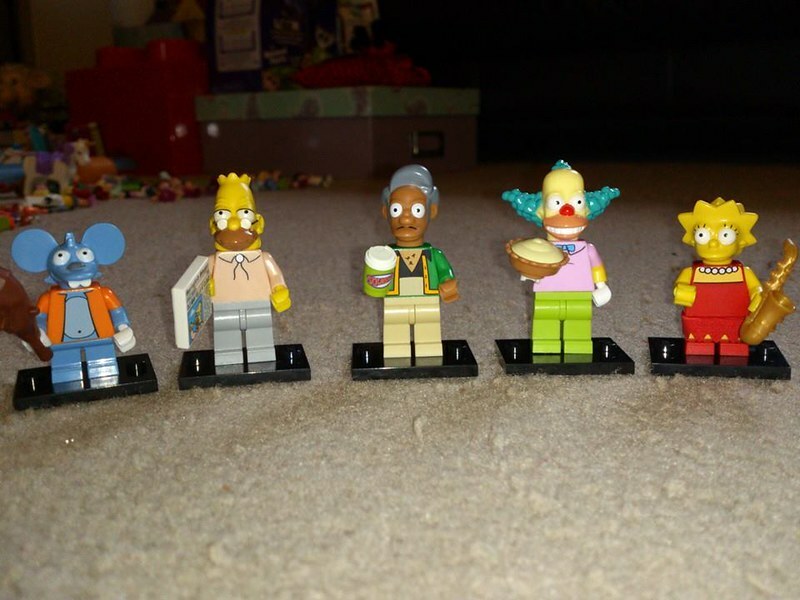 Anyway, thats the first five for me and I have high hopes there’s enough of a difference between each minifig that I’ll be able to get all 16 without any duplicates.